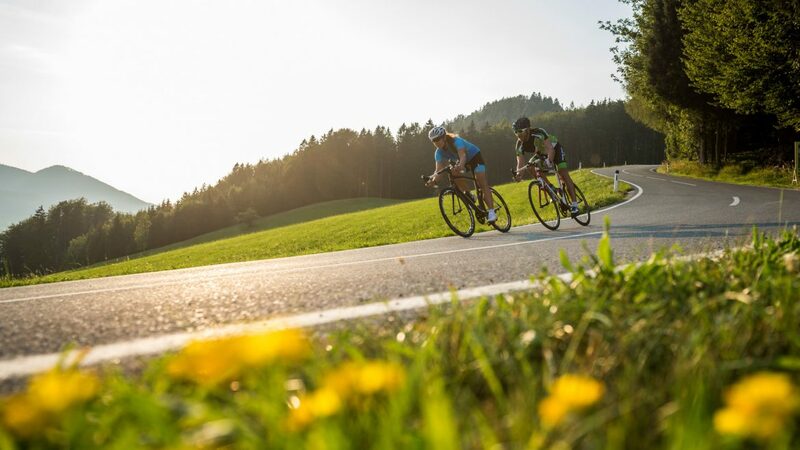 The combination of stunningly beautiful landscapes, sporty challenges, warm hospitality and the best infrastructure ensures that your road bike holiday in SalzburgerLand will be an absolute pleasure. Experience the diverse road bike regions with clear lakes, fascinating mountain peaks and a perfectly built network for your road bike tours in SalzburgerLand. Take a few of the most beautiful lakes in Austria, combine them with the soft hills of the Salzburg Alpine foothills and fine tune all this with an imposing view of one of the highest mountains of the Central Alps. Top it off with 29 perfectly sign-posted racing bike tours through fantastic scenery. The result is one of the most varied and interesting racing bike regions in the world. This road-biking region has been in existence since 2010, consisting of the top destinations of Mondseeland, Attersee, Fuschlsee, Salzburg Lake District, and Eugendorf – Bergheim. Ever since then, bikers of every ability and experience flock to this area. Extreme inclines are the exception, but the many small uphills along the side of the water and and over gentle hills mean you will find some variety in altitude. In addition, 14 specially selected hotel establishments ensure that you will be left wanting for nothing on your cycling holiday. In this area where, in the winter, snow enthusiasts grace the ski resorts, the rest of the year round you will find a sheer abundance of challenges for road and racing bikers. The area consists of the 8 towns of Flachau, Wagrain-Kleinarl, St. Johann-Alpendorf, Radstadt, Altenmarkt-Zauchensee, Eben and Filzmoos, which together ensure that you are guaranteed a varied and fun-filled cycling holiday. If you cycle for pleasure and are on the hunt for rest and recuperation in the midst of unspoilt nature and spectacular mountain scenery, routes through the basin of the Enn Valley are just right for you. If, however, you’re on the search for a sporting challenge you should definitely check out the Amadé Bike Marathon. Sporting diversity is not the only thing of utmost importance in the Salzburg Sports World, but also real Alpine hospitality. The many hotels, B&Bs and guest houses will work hard to ensure that you have everything you need so that your stay is an unforgettable one. Regardless of where you cycle in the Pinzgau area, the astonishingly beautiful mountainous panorama of the Hohe Tauern in the South and Pinzgau Grass Mountains and Limestone Alps to the North will be with you for every rotation of your wheel. These views make all that sweating during the tour really worthwhile. Many routes take you out in to the wonderful mountainous landscape of the Alps, and the only prerequisite is that you have the stamina to master the challenges of this region and enjoy every minute of it. An absolute highlight is, of course, conquering the Glockner (therefore the Grossglockner High Alpine Road) and you can also take on marvellously challenging tours on the Hochkönig circuit and Gerloss Pass. You shouldn’t hold back: the scenic and imposing backdrop will leave a lasting impression on you. For those who cycle for pleasure and would like to saddle up in the Bike Region of Pinzgau, you will find all number of possibilities and well-signed routes to pedal off to your heart’s content. A new addition is the direct Road Bike Rental, where you can rent road bikes and accessories such as helmets, bike clothing and technical equipment. Road bikes can be delivered and collected, and even better – there is no need to clean the bike! In short, this is an easy service for hotel guests who want to take a road bike trip directly from the hotel.